So if you’ve got a dog (or cat) you’re bound to have heard of Frontline right? Yes, they’re the Flea and Tick people! But I guess what you are less likely to know is that these guys make a whole range of grooming products for cats and dogs too, including shampoo, eye cleaner, ear cleaner and skin care gel. 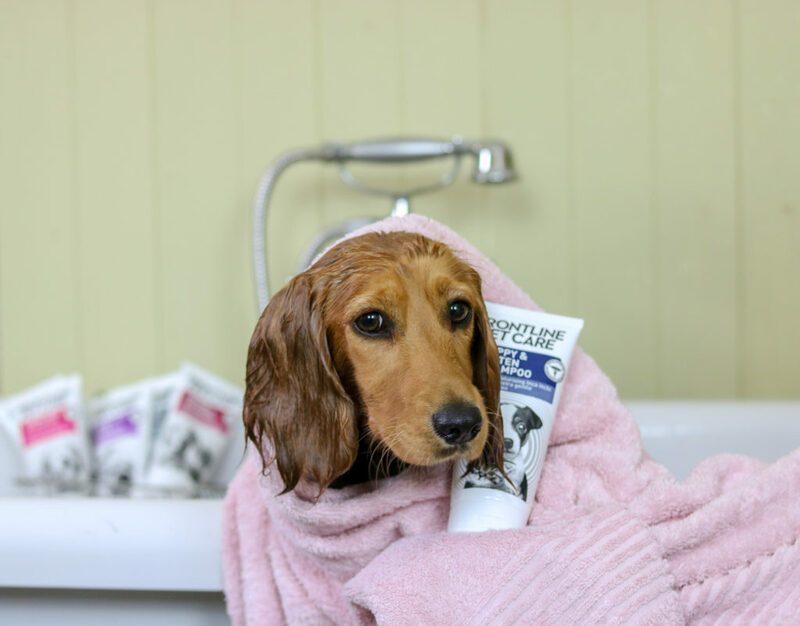 In fact Frontline Pet Care make a shampoo that suits nearly every conceivable situation from Long Coat, White Coat, and Dark Coat shampoo to products for Sensitive Skin, Puppy & Kitten and Odour control. When you think about it this makes perfect sense as we humans always select our shampoo according to our hair type, so why shouldn’t our dogs? Maya and Lucia certainly have very different fur types. Maya volunteered to be first in the tub by covering herself in Eau d’foxy (it’s so on point for this season don’t you know?) on her morning walk. Do I even need to say that she tested the Odour Control variety? 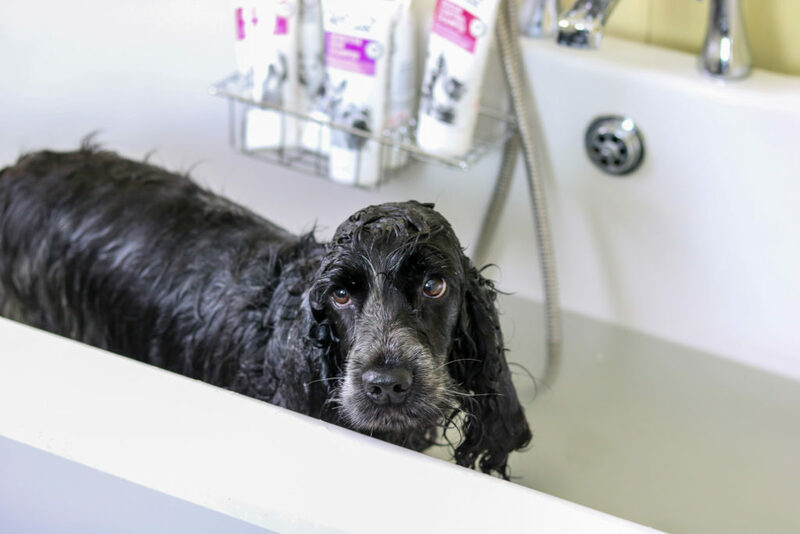 Now, I normally use organic products on my girls, but as most of you probably know Fox Poo is particulary pungent and there has been the odd occasion when removing this particular smell has been a challenge too far for the organic products so I do occasionally have to use something else. So first let’s take a closer look at the Odour Control Shampoo. In terms of ingredients, like all Frontline Pet Care shampoo products it contains Moringa Seed extracts which are added as they are naturally deodourising, Luminescine, which adds shine to the coat, as well as deflecting harmful UV rays and antibacterial Rhamnose. The product also contains quite a few other things and if your pet has skin allergies I recommend you check the ingredients carefully. Frontline products are not all natural, but they have been developed by veterinary experts and I am happy that they are safe to use on my dogs. The shampoo is pleasant to use and spreads easily through the fur, it also lathers up to a nice foam. It has a light and pleasant fragrance too but the big plus I guess was the result, Maya’s fur hadn’t looked as lush in ages and there was not even a whiff of Fox poo! Lucia tested the the Puppy & Kitten variety – and again it did a sterling job of making her fur look healthy, clean and shiny! Lucia really loves the bath and I actually have to shut her out of the bathroom if I’m in it now as she decided to join me for an impromptu splash about the other week!! 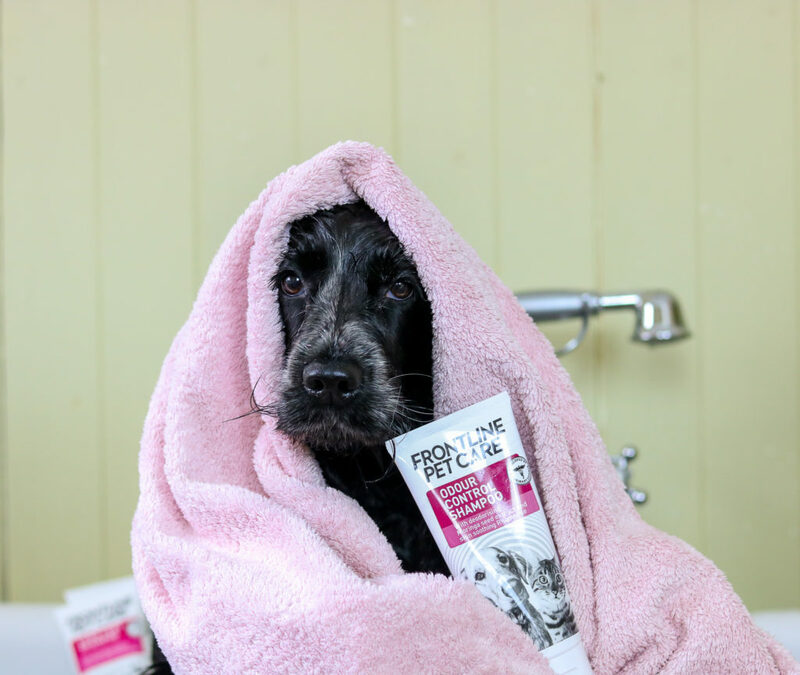 Frontline also sent us some Leave-In-Foam which is really handy for those times that you don’t want to stick your pooch in the bath, either because they don’t like baths, are ill, or you’re simply short of time. I tried it on Maya (she’s a stoic soul!) 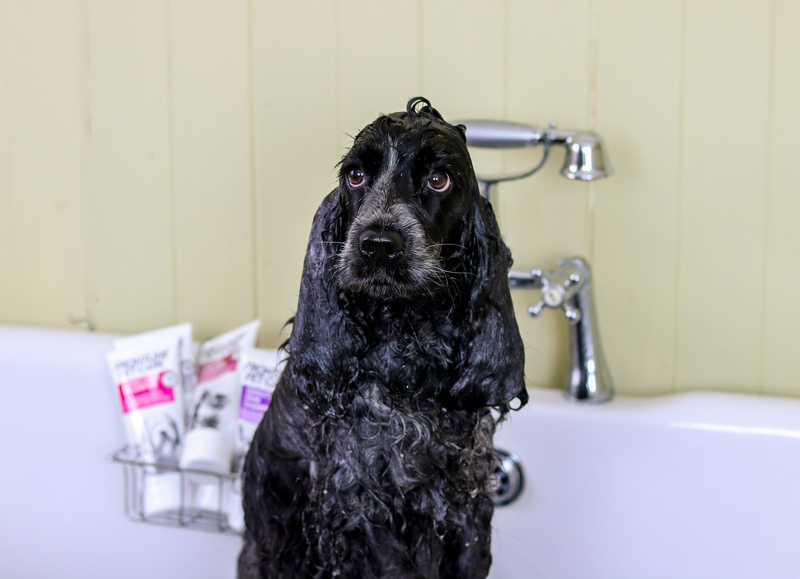 and she actually really enjoyed the process of having it massaged through her fur, she definitely smelt fresher too, although to be honest my girls are such partners in grime, usually only a real bath will do! The company also do Eye Cleaner, which I found excellent for cleaning around Maya’s eyes. 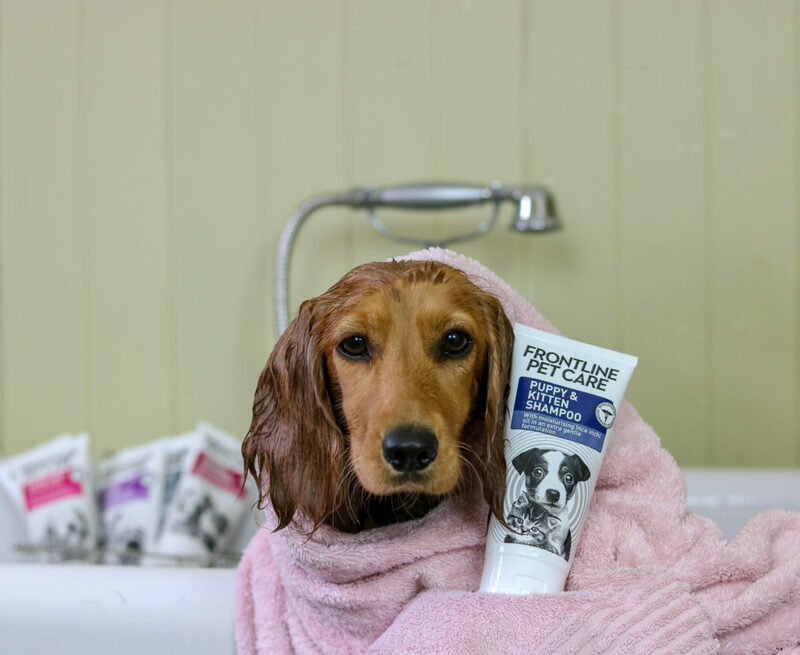 Ear Cleaner (which I will cover more in a future post on Spaniel Ears) Skin Care Gel which soothes and moisturises, great if your pet has dry itchy skin and conditioning spray which hydrates and refreshes the fur. The Frontline range of products are very reasonably priced and a little goes a long way. 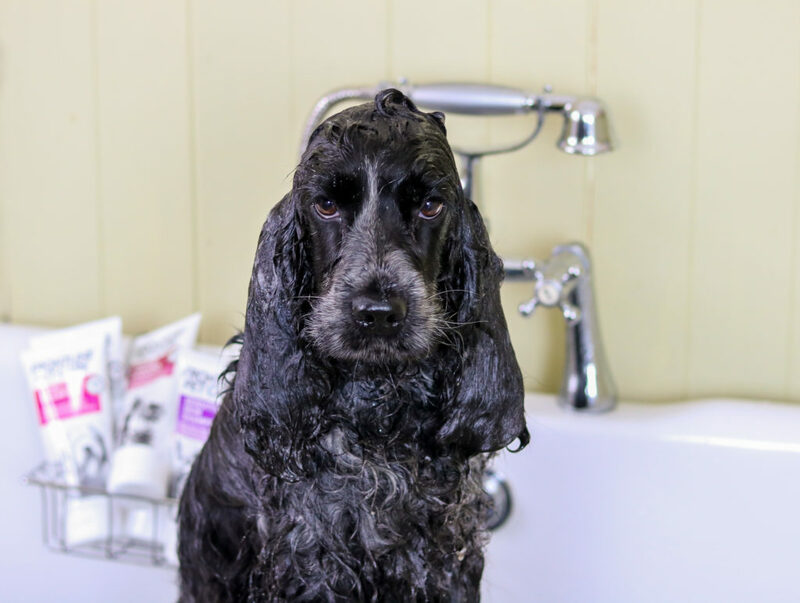 The company recommend that a dog can be bathed with the products up to once a month so as my girls end up in the tub a lot more frequently than that I will probably reserve these shampoos for when they have been up to no good! 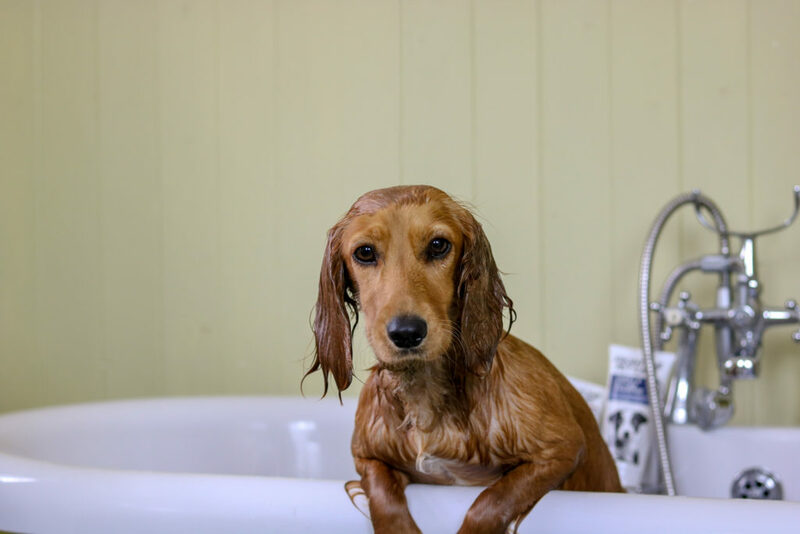 Does your dog enjoy a bath friends, why not leave us a comment and let us know. Although Neville is not keen on baths, he does allow me to bathe him quite well. He’s really not keen on the hairdryer though! Think I’m going to have to invest in a drying coat for him!